Watts Up Mama? : "Girl, You got two in there!" Thanks time hop - I realized today that 2 years ago I found out I was pregnant with the twins! How was that 2 years ago????? Here is the story of how I found out, something I will never ever ever forget! Hope it makes you laugh and gives you some encouragement today! My sweet Steven - When he was born he became my whole world. He was the sweetest baby, one that hated sleep but LOVED his mama. My husband works a lot so many times it was just me and my sweet Roni. I took him everywhere, the park, museums, all the fun places toddlers wanted to go. It was just me and him the majority of the time. He completely changed me into a mother and everything revolved around him, when we ate, when we slept, when we went out. My love for him was so big I couldn't imagine my life with anymore children. So when my husband said he thought we should have another child I was not so sure. At the end of January of 2015, my husband came home from our church’s 21 days or prayer to a very sick wife - Me - sitting in the bathroom floor in a bathrobe, thinking I was totally dying, with Steven hanging on my back. Our church has a period of 21days of prayer at the beginning of the year so we can fast and focus on Jesus and the year ahead of us. I had been praying during the 21 days of prayer that God would use me to the best of his ability that year, that I would be able to trust him more than I ever had before. Little did I know he was answering my prayers in a way I would have never thought. “Mitchell , I am dying - I just know it - Also, Im pregnant so get Steven off of me for a second so I can go to sleep” Yes I know - this was the most romantic way of telling your husband you were pregnant. lol. I don't do romance - I do TRUTH! LOL! I was sick and miserable and had just taken a pregnancy test that read positive almost the second I looked at it. I didn't have time to be all romantic and tell him in a special fancy way - I just wanted him to get Steven off of me for a minute and for me to pass out in the bed! lol! He was so happy, and although I was miserable, I was happy too. It happened very fast and that day while I was sitting in the bed trying to make the morning sickness go away, I realized that it was January - 9 months from January was September - I would be pregnant in the summer - the hot hot hot hot summer - I looked up as if I was talking to Jesus and said “Real funny God - Real Funny!” I did not want to be pregnant in the summer and lo and behold - I would be pregnant in the summer. Bring on the high electricity bill because that air was being turned down to 60 and STAYING there until I gave birth! lol! “TWO WHAT???? ?” was the only response I could say. At this time, Steven knocked over a lamp that was in the room and in the few seconds after I started picturing my life - Kids, kids everywhere - chaos, money here and there, diapers, throw up, what. in. the. world. And then I realized the summer pregnancy - Pregnant with twins in the summer - that Alabama summer - the RECORD BREAKING HEAT OF THE ALABAMA SUMMER! TWINS? HOW? WHAT? WHY? No one ever told me there were twins any where in our family! Twins had NEVER crossed my mind. TWINS! TWINS! TWINS! I didn't speak another word for the rest of the day. The doctor came in, congratulated us and told us how excited he was to deliver twins, how they looked perfectly healthy and how wonderful it was going to be. He gave me some medicine for my extreme sickness and sent us on our way with a picture of the twins just hanging out in my belly, growing perfectly yet terrifying me like crazy. The car ride home was a quiet one. Mitchell kept staring at me, nervous laughter, and then he would tell a corny joke, anything to try to get me to talk but I didn't. He dropped Steven and me off at home and went on to work. After I put Steven down for a nap, I got in the bed and pulled out my phone. I googled triple strollers and almost passed out at the prices of the strollers. Steven would be 26 months old when the twins would be born. I started doubting EVERYTHING- even doubting God. I thought of the things I wanted to do one day and literally felt them crushing at my feet. I had been given some of the best news someone could ever hear yet I was taking it as some of the most horrible news I could ever hear. I then picked up the phone and called my best friend, Jill Rae. Jill has been my best friend since we were in middle school. We are opposites but opposites attract and I couldn't do life without her. She is a missionary in Mexico and no matter how busy she is she always has time to talk and that day was nothing different. She answered the phone and the minute I heard her say hello I started crying. I told her I was pregnant with twins and started going on and on about how I couldn't believe it - how am i supposed to do this, how am I supposed to do that! What am I going to do? Then I started thinking of my prayers from the 21 days. My prayer journal had “ God let me trust you more” written in it probably over 100 times. Now, here, in this moment is when I had to trust Gods plan for my life. He was giving me some of the greatest gifts on the earth. He thought so much of me that he was giving me not only one more precious baby but TWO more precious babies to add to our family. Why? Because he believed in me and he knew I could handle it. If God thinks that much of me, I will take whatever he sends my way! The same day we found out we were pregnant with twins was the first night of our church marriage conference. Mitchell was so happy when he picked me up and I was finally speaking to him. lol. My attitude had been changed by realizing that God was blessing us more than he ever could. The marriage conference was amazing and knowing that I was pregnant and could enjoy the desert without feeling any guilt was just as amazing! lol! The pregnancy didn't seem so hard anymore - It seemed like something I was ready to take on - something I knew God had set for my life. Gods plans were different than mine - Why? Because he wanted MORE from me than I could ever imagine. Are you going through something where you think you just cant make it? Where you wonder if God is even listening? Is this part of his plan? What is he trying to do to me?!?!?!!?!?! Can I assure you that even though you think God is not there, he is! Even though you think that what you are going through is not part of the plan for your life, it is! Jeremiah 29:11 “For I know the plans I have for you,” declares the Lord, “plans to prosper you and not to harm you, plans to give you hope and a future.” God KNOWS the plans he has for our life - plans to give us HOPE and a future! Everything we go through is part of a big puzzle, one we are adding to piece by piece, one that God designed specifically for our lives. 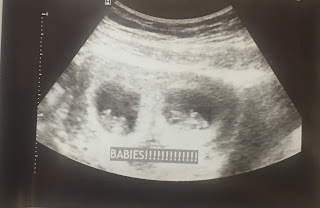 To be honest, the day I found out I was pregnant with twins was one where I pictured my life in shambles. I cried so hard thinking I was going to never be able to do anything for myself anymore. I had a selfish way of viewing my life and I also had issues with letting go and letting God. My plan was to have another baby and live the perfect little life in my perfect little house with my perfect husband and perfect, equal numbered family. But that is not what God saw. He saw SO much more for me. He wanted to bless me MORE than I could ever imagine and more than how I had planned it out to be. My prayers were being answered - I was learning to trust him and even though some days are harder than others I trust him more and more every single day. I am so glad that God is in control of my future and not me. Gosh, I can barely control my laundry pile - I sure don't want to be in control of my future! 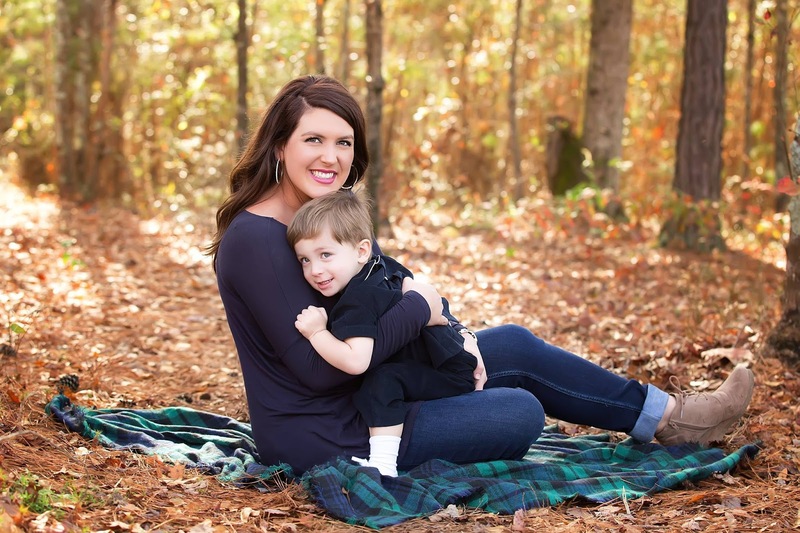 I survived the Alabama summer bring pregnant with twins and a toddler. It was not easy but I did it!! lol! This time 2 years ago I was a terrified mother trying to figure out what Gods plans were for my life and here I am today, confident and in awe of what God has done in me since then. I am so thankful for these sweet precious babies of mine. And although I was so worried my love wouldn't be big enough for more children, it was. 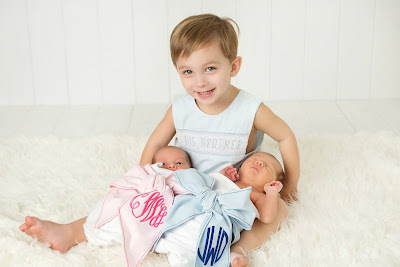 My love tripled when we added baby 2 & 3 to our life. I am so underserving and so thankful for his blessings on my life. And of course - I cant leave out the video telling our parents we were pregnant with twins. When we told my parents we were pregnant with Steven the video ended up on America’s Funniest Home Videos and of course this one is just as funny! They had been keeping Steven over the weekend so we could go to our church marriage conference. Doesn't my mama look just adorable in her moo moo? LOL!!!!!! !